Okay, I’m sorry I haven’t been blogging much in the past few months. As I’ve explained before, the re-election of the Tories left me profoundly depressed and dispirited with the state of politics in this country, and the mindset of the British people. I’ve also been trying to write a book on the British Empire and slavery. That’s also taken up a lot of my time. However, I’ve come across a few items, which I think really deserve to be blogged about. One of them is about Cameron supposedly performing a lewd act with the head of a dead pig. There’s so much going on with that story that I intend to devote a whole post about it. But first there’s this piece, by Yasmin Alibhai-Browne, on the evils of the Saudi Regime. Alibhai-Brown’s one of the journos on the Independent. She’s of Ugandan Asian heritage, and is married to a White British man. She writes mostly, though not exclusively, about racial issues, as well as women, and, of course, Islam and the position of Muslims in modern British society. I’ve got a lot of respect for her, as she will tackle difficult issues that many others won’t touch. She has, for example, covered anti-White racism as well as the more familiar variety inflicted on ethnic minorities. This was in the first few years of this century, when the statistics showed that more Whites were the victims of race hate crime than Blacks or Asians. I admired her for that, as she showed that you can tackle that issue without having any sympathy with the Fascist Right or the racial reactionaries of the Tory party. The jaw simply drops. Saudi Arabia executes one person every two days. Ali Mohammed al-Nimr is soon to be beheaded then crucified for taking part in pro-democracy protests during the Arab Spring. He was a teenager then. Raif Badawi, a blogger who dared to call for democracy, was sentenced to 10 years and 1,000 lashes. Last week, 769 faithful Muslim believers were killed in Mecca where they had gone on the Hajj. Initially, the rulers said it was “God’s will” and then they blamed the dead. Mecca was once a place of simplicity and spirituality. Today the avaricious Saudis have bulldozed historical sites and turned it into the Las Vegas of Islam – with hotels, skyscrapers and malls to spend, spend, spend. The poor can no longer afford to go there. Numbers should be controlled to ensure safety – but that would be ruinous for profits. Ziauddin Sardar’s poignant book Mecca: The Sacred City, describes the desecration of Islam’s holiest site. Even more seriously, the pernicious Saudi influence is spreading fast and freely. King Salman has offered to build 200 mosques in Germany for recently arrived refugees, many of whom are Muslims. He offered no money for resettlement or basic needs, but Wahhabi mosques, the Trojan horses of the secret Saudi crusade. Several Islamic schools are also sites of Wahhabism, now a global brand. It makes hearts and minds small and suspicious, turns Muslim against Muslim, and undermines modernists. She’s absolutely right about the destruction of historic Mecca, including the buildings, monuments and homes of Muhammad and his companions – the holiest figures in Islam. The Independent has published a number of pictures showing how the city has been effectively gutted in a frenzy of building and modernisation. This has been ostensibly to provide more accommodation and greater access for the millions, who go to the city every year on the Hajj, the pilgrimage to Mecca. But it also shows the Saudis’ deep lack of concern, even contempt, for their country’s ancient monuments. Much of the radical Islamism now threatening the world is Saudi in inspiration. considering the destruction the Saudis have inflicted on Islam’s holiest city, I’m not remotely surprised that ISIS have been so keen to destroy ancient monuments they consider to be ‘against Islam’. And that’s a highly elastic phrase, which also means genuinely Muslim monuments, but from a sect or interpretation of Islam they hate or mistrust. As well as banning non-Muslim religions, other Islamic sects are also banned in Saudi Arabia. The Shi’a live in marginalised villages without gas, electricity or running water. They are not allowed to build or worship in their own mosques, and their religious literature, including their version of the Qu’ran, is illegal. When copies are found, they are confiscated and destroyed. A few years ago the Grand Mufti declared them heretics, who were worthy of death. Some of the destruction they have caused seems to be directed against the Shi’a. A few Saturdays ago the Independent’s sister paper, the ‘I’, carried a story about the Saudis’ bulldozing the homes occupied by Muhammad and his followers. While these are naturally of considerable veneration to Muslims generally, the Shi’a in particular venerate them and travel to them when making the pilgrimage. As for the Saudi’s fixation with secular money-making, it’s pretty much been the case in that part of the Islamic world since the Middle Ages. Mecca became extremely rich on the money spent by the pilgrims flocking there, and much of the poetry written during the Middle Ages was extremely secular. It wasn’t about the delights of paradise, or the beatific vision of God’s face awaiting the faithful in paradise, or about religious devotion to Muhammad, his companions and the Qu’ran. No, it was about the delights of getting drunk on wine, and having a great time with the slave girls. I’ve read accounts of interviews from moderate Muslims around the world, who have lamented how the religion in their countries has become increasingly intolerant and violent due to the influence of preachers, who have gone to Saudi Arabia and Pakistan to study. And moderate Muslims over here have voiced the same concerns. There was also a piece published nearly a decade ago in the Saturday edition of the Financial Times by the imam, who received Salman Rushdie back into the faith after he emerged from hiding. I’m afraid I really can’t remember the imam’s name, except that his first name is Zakariya, if I remember correctly. This scholar has written extensively about Islam in Britain, as well as inscriptions in Arabic dating from the 17th century and found in churchyards in Yorkshire. This particular imam wanted the British government to invest in a British Islamic seminary. There was at the time a shortage of imams to serve in British mosques. This allowed some of the fire-breathing bigots from outside Britain to jump the queue at immigration, and spread their message of hate to Brits over here. And I’m afraid the situation is only going to get worse. According to an article I read back in the ’90s in the Encyclopaedia of Islam, foreign governments sponsor and support mosques in the West to promote their own national influence. That means that the 200 mosques the Saudis intend to build in Germany will reflect the hard-line attitudes of Saudi Arabia, rather than a more liberal, Western form of Islam that the moderates look forward to. As it stands, there has already been friction and accusations of separatism in Germany directed against some of the Turkish Muslim organisations. In the ’80s or ’90s there was a controversy within the German labour unions against some of the Turkish labour organisations. The Germans alleged that despite their talk of integration, the Turkish groups were pursuing a separatist agenda. A German-Turkish writer has also described how, when he was a child, he had ethnic German, non-Muslim friends until one of the Turkish Muslim scholars told their community that they shouldn’t have anything to do with them. Politicians and activists across Europe are worried about the growth of parallel communities, which attempt to cut themselves off as far as possible from outsiders, whether, White, Black, Asian, Muslim, Jewish, Christian, secular or whatever. One Islamic community leader on a programme about racial problems in contemporary Britain, spoke about his fears for the development of Muslim communities, whose citizens would only know other Muslims. His views were echoed by the representatives from the other faiths – Judaism and Christianity, who also appeared on the programme. They were similarly worried that their peoples would also grow up in sealed communities interacting only with members of their own faith. All this is likely to get worse if the Saudis are allowed to proceed unchecked. And, quite simply, I don’t think there is the political will to prevent it. Alibhai-Brown points out later in the article how close the royal family is personally to the Saudis. There’s also the awkward fact that they dominate the oil economy. They can throw their weight around now, because of the way they learnt they can wreck the global economy by raising or dropping the price of oil, as they did during the energy crisis of the 1970s. All they have to do is drop their prices, and the Texas oil industry – or Venezuelan, for that matter, is decimated. And the profits to be made from their oil company, Aramco, are just too massive to be resisted by Western industrialists and politicians. And so it seems that the Saudis can spread global terror and religious hatred with impunity. The whole article can be read at: http://www.independent.co.uk/voices/the-evil-empire-of-saudi-arabia-is-the-west-s-real-enemy-a6669531.html. Go and read it. I don’t think what she said about there having been no coverage of the iniquities of the Saudi regime is completely accurate, however. A little while ago there was a documentary on Channel 4 about radical and extremist Islam, which included some of the viciously anti-Semitic and anti-Western teaching coming out of Saudi mosques and madrassas. That provoked a critical article about the Saudis in parts of the press. I think the Daily Mail ran a piece. But it shows how seriously that kind of journalism is taken in that it appeared on Channel 4, which was already set up as the alternative cultural channel to BBC 2, the Beeb’s alternative channel for more serious culture. Despite the horror and violence of the situation in the Middle East at the moment, I believe that there are still opportunities awaiting us to bring about peace and tolerance. But these will be blocked if we allow the Saudis to continue preaching intolerance. The world’s peoples – Muslim and non-Muslim – deserve better. Earlier this morning I reblogged Tom Pride’s piece exposing the Daily Mail’s latest dirty trick in stirring up trouble between Muslims and non-Muslims. A journo for the Heil had turned up on an Islamic internet forum as a Muslim, and posted comments trying to provoke them into attacking and vilifying their country and its non-Muslim peoples. They smelled a rat, however, and didn’t fall for it. Looking at the disguised poster’s account, they traced it back to the Evening Standard, which used to be part of the Mail group. It’s a nasty, dangerous piece of deception. Apart from the increased threat of terrorism, and the danger of young Muslim men turning to militant fundamentalism as a release for their social frustrations, Muslims themselves are also very much the victims of racist and sectarian attacks. A Saudi woman studying over here was murdered last week for wearing the niqub, or full face veil in the street. If the Heil journalist had succeeded, his deception could very well have cost an innocent person their life. It is also illegal. As I blogged in my comment to the piece, there are laws against the state using similar tactics to entrap people. Although Sir Robert Peel, the Prime Minister, who created the London police force in the 1820s abolished agents provocateurs in the 1820, the cops seem still set on using them, and then being prosecuted in turn when they’re exposed. It is also an offence in British law to stir up racial hatred, as the BNP and National Front know full well and for which they and their members have been arrested and prosecuted over the years. It’d be very interesting to see Paul Dacre standing in the dock with Nick Griffin, Andrew Brons and the other storm troopers. 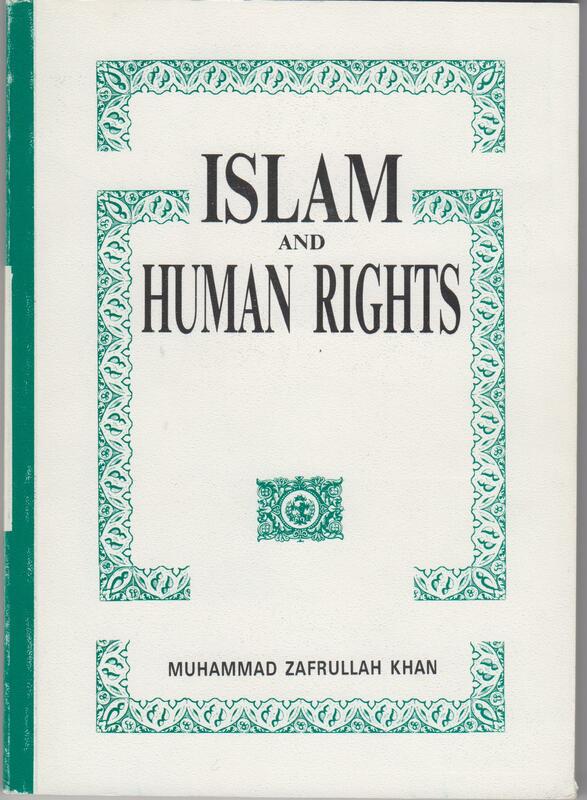 I have, however, also come across over the years a number of books written in support of human rights and democracy from an Islamic perspective. I’m writing about them as a corrective to the manipulative and dangerous rubbish written and done by the Standard, the Heil and the like. I bought this back in the 1990s when I was studying Islam at Uni. It’s written by a very senior Pakistani judge, religious scholar and human rights politician and advocate. The blurb on the back states that the author, Muhammad Zafrullah Khan, served as the Pakistani foreign minister in 1947, led the Pakistani delegation to the UN General Assembly, where he was president at its seventeenth session. He has also been at various times a judge and president of the International Court of Justice at the Hague. The book is an attempt to show that the UN Declaration of Human Rights is in accordance with Muslim belief, and showing how the Qu’ran and religious literature support its provisions. The book begins with the Declaration, and then proceeds with chapters on man and the universe, and social and economic values. Chapter five then goes through the Declaration of Human Rights article by article, citing Islamic texts to support them. Chapter 6 is on ‘Prevalent Attitudes towards Human Rights among Muslims’, while the last chapter, seven, is on the ‘Future Relationship between Islam and the Universal Declaration of Human Rights’. Looking through the religious section of one of the charity bookshops on Friday, I came across this book, published by the University of Florida Press. This was another book, which examined the Islamic texts used by the militant fundamentalists in their attacks on democracy and other western conceptions of liberalism and human rights. It showed that, contrary to the assertions of the militant Islamists, the texts didn’t quite say what they thought they say, and can be used instead to promote democracy, pluralism and tolerance. It’s a useful approach, and more like this is needed to combat the claims made by the militants. There are a number of reasons for the growth in militant Islam throughout the world. Some of it is the result of globalisation displacing and impoverishing peoples, tribes and social groups, who are already struggling to make ends meet in the Developing World. See, for example, Alex Perry’s Falling Off the Edge: Globalization, World Peace and Other Lies (London: Macmillan 2008). Other factors are the failure of secular politicians in Egypt and elsewhere in the Middle East and Arab world, whether capitalist or Communist, to provide jobs, opportunities and economic development. See Bassam Tibi’s Islam and the Cultural Accommodation of Social Change (Boulder, Colorado: Westview Press 1990). Other factors are the continuous Western political intervention and imperialism in the Middle East, and its support of a series of unpopular and bloody tyrants in the region. See Said K. Aburish, A Brutal Friendship: The West and the Arab Elite (London: Gollancz 1991). On that latter point, I’m really not surprised about the sectarian violence in Iraq. Apart from the deep tribal and sectarian divisions between its peoples, the western occupation has comprehensively wrecked the country’s economy. Western corporations scramble and lobby for the sale of the country’s state industries, which they duly purchased, they have also attempted to lock the private ownership of the nation’s oil industry in Western hands into the country’s constitution. The Neo-Cons also tried to turn it into a free trade utopia following the ideas of Von Hayek and co. They removed all the tariff restrictions against foreign imports, with a result that everyone in the world dumped their cheap goods on the nation. Unable to compete, the much of their own manufacturing industries went bankrupt and unemployment shot up to 60 per cent. When you have that many people poor, hopeless and angry, you can expect it all to explode into violence. As for domestic fundamentalists and Islamic terrorists, Yasmin Alibhai-Brown writing in the Independent this week pointed to psychological causes within the minds of some of the young men, who get caught up in it. By and large the fundamentalist terrorists are not the poor and uneducated, but often highly educated people, often from a very westernised background, who are torn by internal conflicts about their identities as western citizens and Muslims. And lack of job opportunities is also very frequently a factor. This all needs tackling. Alibhai-Brown stated that the attempt to tackle the psychological causes of Muslim domestic terrorism and militancy was abandoned in Britain, as Blair and successive administrations sought solutions in interfaith dialogue and foreign policy. In my opinion, that’s needed too, but not to the exclusion of other, psychological approaches. My point here is that it’s not simply a straightforward, simple case of religion alone causing violence and conflict. And the above books are here trying to make a positive improvement to the situation by showing that a reconciliation between Islam and democracy, human rights and religious and ethnic pluralism is possible. Unlike the Evening Standard and the Mail, which just wants to stir up even more hatred to sell a few more copies of their wretched rags. As Rachel Johnson (editor of the Lady and sister of Boris Johnson) puts it: ‘What we’re having is a media which is run by the middle classes, for the middle classes, of the middle classes, aren’t we?’ She is spot on. The journalists who have stirred up chav-hate are from a narrow, privileged background. Even papers with overwhelmingly working-class readerships join in the sport. Kevin Maguire told me of a Sun away day in which all the journalists dressed up as chavs. Chuckle at their venomous columns by all means, but be aware that you are revelling in the contempt of the privileged for the less fortunate. 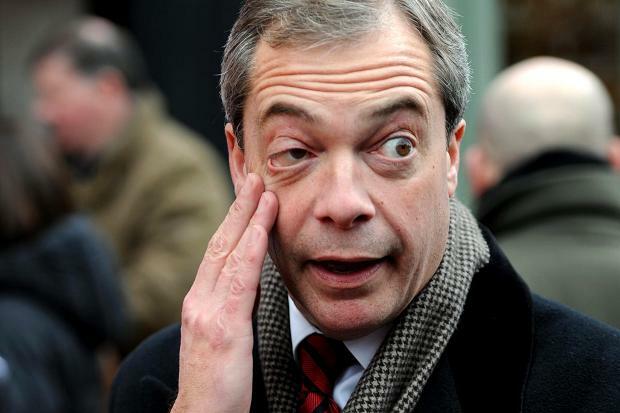 In the current climate of chav-hate the class warriors of Fleet Street can finally get away with it, openly a flagrantly: caricaturing working-class people as stupid, idle, racist, sexually promiscuous, dirty, and fond of vulgar clothes. Nothing of worth is seen to emanate from working class Britain. (p. 119). He then goes on to describe how such hatred and contempt for ‘chavs’ has become an amusing pastime for the privileged members of the Middle Classes, including Prince William, at Oxford and Cambridge Universities. This chav-hate has even become a fad among privileged youth. At universities like Oxford, middle-class students hold ‘chav bops’ where they dress up as this working-class caricature. Among those mocking the look was Prince William, one of the most privileged young men in the country. At a chav-theme fancy dress party to mark the end of his first term at Sandhurst, he dressed in a loose-fitting top and ‘bling jewellery’, along with the must-have ‘angled baseball cap’. But when the other cadets demanded he ‘put on a chavvy accent and stop speaking like a Royal’, he couldn’t do it. ‘William’s not actually the poshest-sounding cadet, despite his family heritage, but he struggled to pull off a working-class accent,’ one cadet told the Sun. Welcome to twenty first century Britain, where royals dress up as their working-class subjects for a laugh. A place like Oxford is fertile ground for chav-hate. Nearly half of its students were privately educated, and there are very, very few working-class people attending the university at all. It helps unlock the truth behind the phenomenon: here are privileged people with little contact with those lower down the scale. it is easy to caricature people you do not understand. And indeed, many of these students owe their place at Oxford to the privileged circumstances that brought them a superior education. How comforting to pretend that they landed in Oxford because of their own talents, and that those at the bottom of society are there because they are thick, feckless or worse. It is the peculiarity of privilege and of every privileged position to kill the intellect and the heart of man. The privileged man, whether he be privileged politically or economically, is a man depraved in intellect and heart. 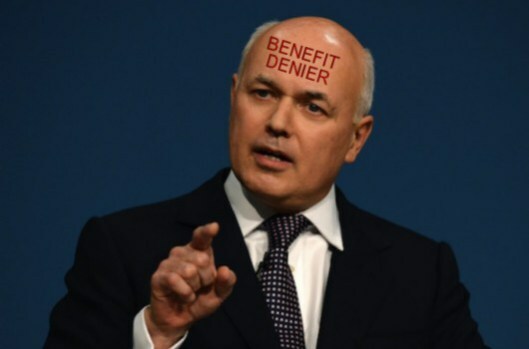 IDS: Just about everything about him corroborates Bakunin’s comments on privilege. Clearly not everyone in the upper or middle classes is a mass of seething hatred and contempt for the working class, despite the efforts of the columnists of the Daily Mail and Telegraph. And very few would wish to see present society destroyed rather than reformed in the wave of apocalyptic violence Bakunin recommended. ‘Even destruction is a creative act’, as he described his attitude to the exploitative state and contemporary society. But it does describe the class attitude, and privileged hatred of the poor and disadvantaged shown by the very upper class members of the Tory front bench. 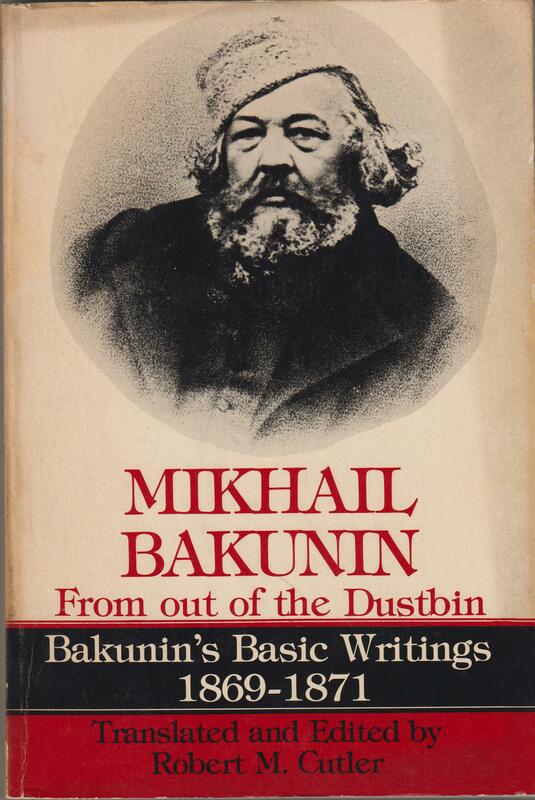 After all, with Cameron, Clegg, Osborne and IDS presiding over an administration determined to destroy the welfare state, reforms that have resulted in as many as 38,000 deaths per year, it’s difficult not believe that Bakunin had a point about the corrupting influence of privilege. This needs changing, and fast. And it must be through the ballot box that such class hatred, oppression and exploitation must be removed.